My creative business “Autumn Place Arts” has been going strong since the year 2000. Being a creative type, I enjoyed Shop and Home Economics classes in high school, however I consider my dad my best inspiration. Growing up helping him in his auto body shop, learning the profitable “tricks of the trade” of extending the use of what you have to work with. He is still loving what he does, and he’s amazingly talented! Giving a “second life” to a large variety of tossed and found items. 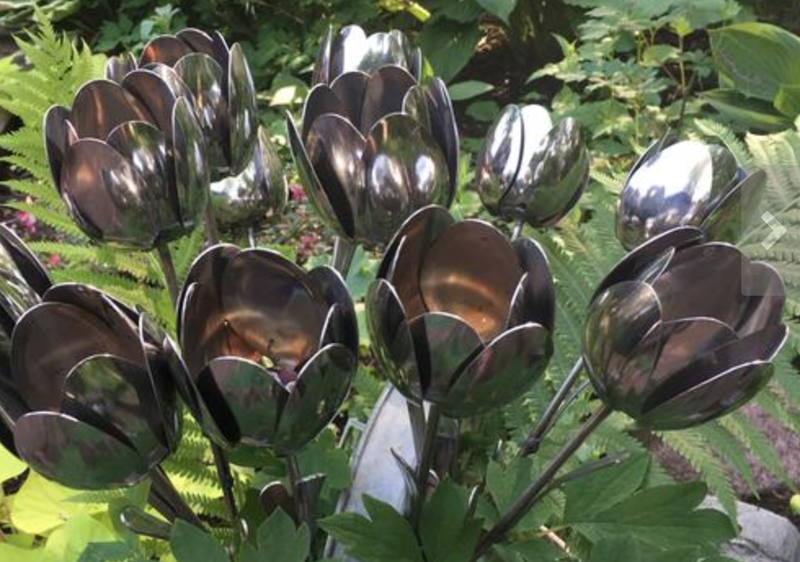 Tom would say cutting all the silverware pieces and bending petals for his recycled silverware garden art. My least favorite part of our business would be cleaning the greased rods before Tom welds the flowers to them. My life appears be a constant “bounce” of finding, cleaning, recycling, designing, pricing, showing, and the best part...selling, of course! Ah yes, we get constant reminders that we “work” too much. Explaining that our profitable hobby looks like work to others (which it is) is also a enjoyable pastime for us. With that said, we also take time out for boating, dining out, and spending time with friends and family.